Turkish writer; born at Adrianople, European Turkey, in 1857; attended the Talmud Torah in that city, pursuing his Talmudic studies at a yeshibah. After having presided over a small seminary at Adrianople, he was appointed director of the seminary founded by the Alliance Israélite Universelle at Constantinople. Under the title "Toledot Bene Abraham," he published a Hebrew translation of Theodore Reinach's "Histoire des Juifs," Presburg, 1888, completing the story, as he says in the preface, by extracts from Graetz, Geiger, Kalman Schulmann, and others. Under the title "Maskil le-Aidan" (Aidan's Poem; , abbreviation of "Abraham Josef Danon"), he published a series of Hebrew translations of the poems of Vergil, Victor Hugo, and Sadi, together with some original contributions (Adrianople, 1888). In Sept., 1897, he went to Paris to represent the Oriental Jews at the Congress of Orientalists. 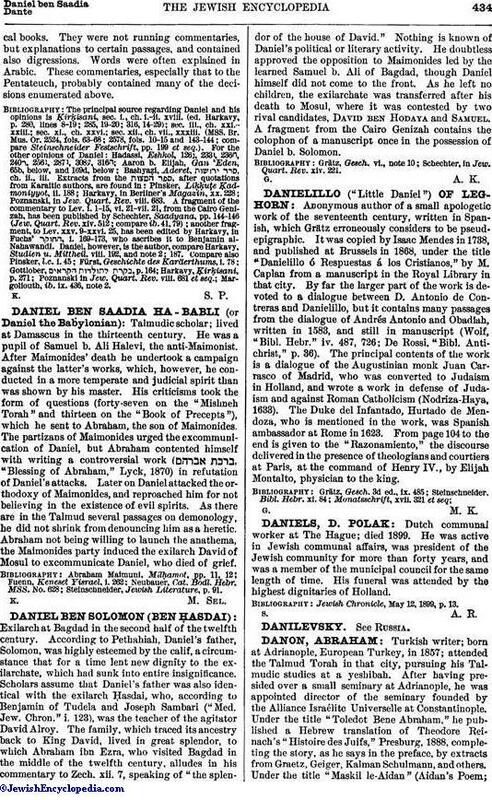 Danon's chief distinction rests on his initiative in founding at Adrianople in 1888 a historical review, bearing the title "Yosef-Da'at," or "El Progresso," which was published in Hebrew characters and in three languages; namely. Judæo-Spanish, Hebrew, and Turkish. The aim of the review was to collect all the documents relating to the history of the Oriental Jews. But the Ottoman government censorship suppressed this review, together with all others published in Turkey. As the fruit of patient labor, Danon published a collection of fifty-five Judæo-Spanish ballads which are sung in Turkey, each ballad being accompanied by its French translation. They first appeared in the "Revue des Etudes Juives," xxxii. and xxxiii., and were published separately by Durlacher, Paris in 1896. They form one of the most curious chapters in the literature of the Oriental Jews. 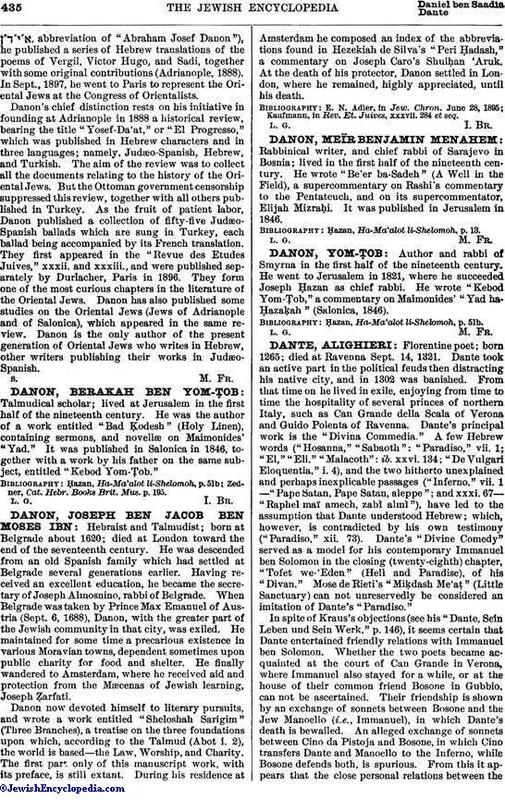 Danon has also published some studies on the Oriental Jews (Jews of Adrianople and of Salonica), which appeared in the same review. Danon is the only author of the present generation of Oriental Jews who writes in Hebrew, other writers publishing their works in Judæo-Spanish.